Centryco Bellows are available in a wide variety of construction, sizes, and fabrics to accommodate your application. Our Sewn construction (BS) is utilized for our general-purpose bellows to protect moving rods, shafts, screws, or other linear mechanisms from dust to weld spatter. Our Molded (BM) or RF Welded (BW) Bellows are available for watertight, aesthetics, strict compression, and other specialty applications. Sewn bellows are made from a series of stamped annular rings which are sewn together to form the individual convolutions. Special “split” bellows are available with a zipper closure to eliminate machine disassembly and downtime. Sewn Bellows are offered in a variety of materials and material thickness’ with superior abrasive resistance to accommodate various applications including protection from most industrial contaminants, high-temperature, and welding sparks to name a few. 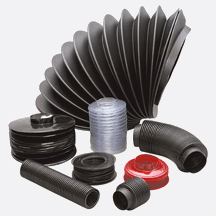 Molded Polyurethane Bellows (Black) are available in stock sizes (1 or 2 foot lengths) or non-standard sizes. New Radio Frequency (RF) Welded Bellows offer many of the same advantages as our molded bellows and are ideal for a broad range of applications. 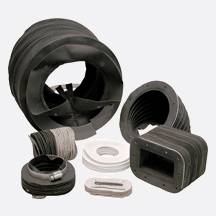 Determine the Bellows size for your application. Describe your environment to select the proper materials. Select your choice of mounting. Describe any other features you would require for your application.